Zoe came down to Bacon’s Acres for “squirrel season:” the beginning of fall training and time to get ready for the long winter ahead. Back home in Nome, she reflects on what she learned. When I moved to Bacon's Acres nearly 8 years ago, I was challenged, proud and entertained by my crash course in learning to live off the grid. It felt good. It felt green. It was all a very new experience for me. When I lived a simple cabin life (for about 6 months before I started my dog team), it was fabulously simple and peaceful. It didn't matter if my solar/battery system worked consistently or not. I didn't have a dog team needing to be fed and watered. I didn't have ATV's that needed to start so we could do our training runs. I didn't have freezers of meat and fish to feed the dogs. After an experience with a couple very nasty freezers and consistently frozen water lines, in 2015 I put in a work order to investigate bringing power to Bacon's Acres. Somewhere in the decision-making process other life events (as well as timing and finances) trumped such a major project. Our living structures are nearly 1000' from the main power line, and the power poles must pass through swampy ground. Also, I waivered on wanting to give up the "simplicity" of off the grid living. My decision to go back on the grid took an acceptance of the fact that I'm not currently choosing to live a simple life. Initially, I felt like going back on the grid was "selling my soul". After much reflection, I decided I was "buying my sanity". We continue to use our solar panels and batteries, but now have the convenience of consistent power to use as needed. An instantaneous elimination of an abundance of mind clutter. Here's a huge thank you to all of you who helped make this process happen!!! "This is a tough run with some short stretches of extraordinarily difficult trail. If the musher didn’t blow on through early in the morning, they should try to leave Finger Lake by three or four in the afternoon so there's some daylight left for the worst parts. (It can be done in the dark, but it isn’t recommended unless you know what you’re doing.) Figure three to five hours for the run. One might consider latching the drag up and out of the way before leaving the checkpoint, and plan on using the brake only. There are often all kinds of things poking up out of the trail. After leaving Finger Lake, the trail climbs steeply over a ridge to Red Lake, runs along it for a mile or two, swings up a ravine, and then follows a series of climbing wooded shelves interspersed with open swamps. About ten miles from Finger Lake, the trail drops down a series of wooded benches toward Happy River, then onto the river itself via the dreaded Happy River steps. Then it’s down the river to its mouth, up the Skwentna River for a few hundred yards, and back up a steep ravine to the plateau on the south side of the Happy. The trail will cross Shirley Lake, then Long Lake (11 miles from Rainy Pass Lodge) and then run along the steeply sloping mountainside above the south side of the Happy River valley to the checkpoint. There are two nasty stretches of sidehill trail in the last eight miles." "The distance from Skwentna to Finger Lake, population 2, is 45 miles. Roughly, it’ll take four to six hours to cover the mostly uphill route but the trail isn’t too tough. The teams will run across rivers, lakes, swamps and wooded areas. Finger Lake is a tent checkpoint that’s located at the eastern edge of the Alaska Range in snow country. It’s not unusual to have TEN FEET of snow on the ground! Lots of humans fly out to Finger Lake to watch the race. Kirsten and Karl Dixon who run Winter Lake Lodge provide hospitality for Iditarod spectators. The real name of the lake is Winter Lake, but the lake is shaped like a two-mile long finger so many old timers and for Iditarod, the checkpoint is known as Finger Lake. Winter Lake Lodge is a luxury summer lodge. Folks go there for wellness, cooking classes, hiking, fishing, kayaking, rafting, mountain biking and dog mushing. There are lots of birds, flowers and berries that are rare to other places. Action picks up at Finger Lake/Winter Lake Lodge early on the second day of the race and because it’s early in the race, the action is intense. Teams arrive in a steady stream, one right after the other. Most teams stay and rest during the “heat of the day.” Mushers have to carry enough food with them from Skwentna to feed their dogs at Finger Lake, as there are no musher bags flown out to Finger Lake. Dogs are very happy to eat a tasty meal and then snooze while the temperature tops out in the early afternoon." We're looking forward to racing on toward Rainy Pass, the fourth Iditarod checkpoint!! Skwentna Sweeties: We Made It... and Tara and Team are on their way!!! Before Kristin's first Iditarod journey as a musher, she was a Skwentna Sweetie for 10 years. The Sweeties and Darlings are groups of dedicated individuals who staff Iditarod's Skwentna checkpoint at the Dehlia's homestead each year. These volunteers make the Skwentna checkpoint a home away from home for its volunteers, race officials and mushers. It was here, in Skwentna in March of 2011, where Kristin was introduced to Ryan Redington, who later sold her the mother of her first litter of pups (Libby). 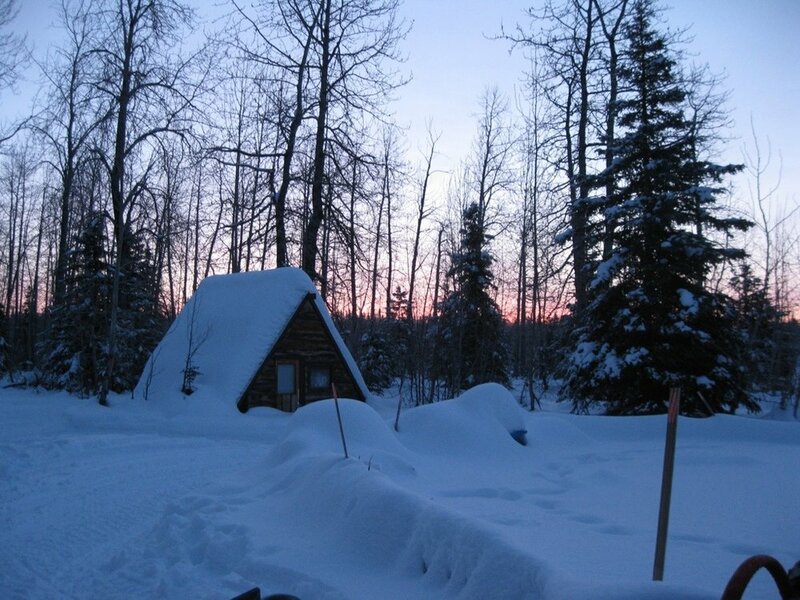 “The distance from Yentna Station to the second checkpoint, Skwentna is 34 miles. These are easy miles for the mushers and dog teams as the trail follows the Yentna River until joining the Skwentna River a couple of miles short of the checkpoint. You can’t believe how exciting and noisy it is to have all the Iditarod teams come through a checkpoint in just 12 hours. As the race goes further down the trail, it spreads out but in the early checkpoints like Yentna Station, Skwentna, Finger Lake and Rainy Pass, all the teams are still pretty close together. Many thanks to all those who have helped us get to both Yentna and Skwentna. We’re looking forward to many more adventures as we work our way toward Finger Lake!! “The distance from the Willow restart to the first checkpoint, Yentna Station is 42 miles. These are easy miles for the mushers and dog teams as most are on frozen rivers or well traveled snowmachine trails. Most of the traffic at Yentna Station goes straight on through, stopping just long enough to check in and pick up supplies. Officially, this checkpoint is known as the Yentna Station Roadhouse. The nearest road is more than 40 miles away! The only way to travel to Yentna in the winter is by plane, snowmachine or dog team. In summer you can add boat because the checkpoint is located on the Yentna River. Roadhouses are quite significant in Alaskan history. They are like hotels that were built along trails used by miners, mail carriers, loggers and anyone else who had to travel along wilderness trails. They were generally built a “day’s travel” apart. Some were permanent wood structures while others were just temporary tents. Some were quite nice while others just provided shelter and a meal. The Yentna Station Roadhouse doesn’t date back to the gold rush days or when mail was delivered by dog team, but it has a rich and colorful history. It is obvious to know what the team will be focusing on this season: training for and racing Iditarod 2018. 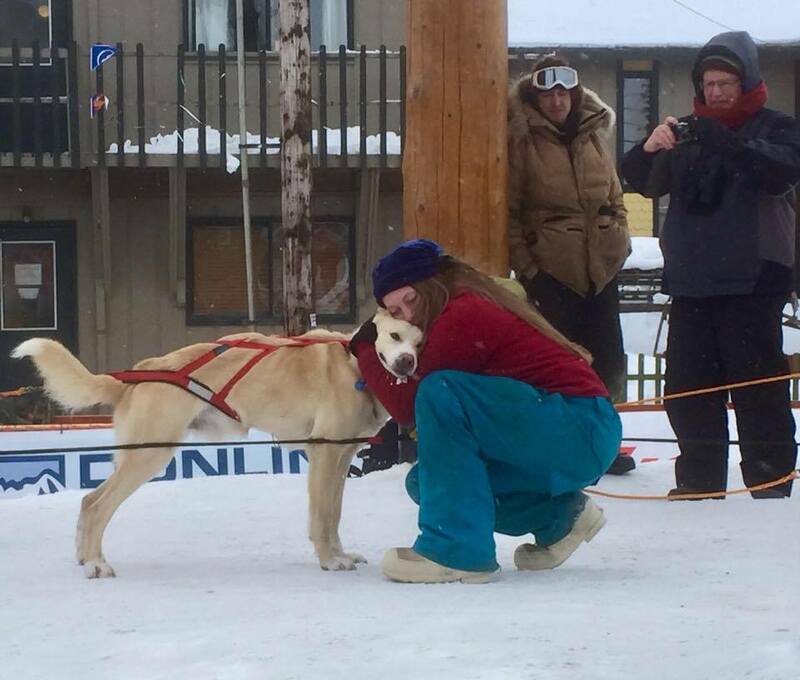 Tara, my friend and handler, will have the main spotlight, as we signed her up for The Last Great Race in June at the Iditarod picnic. Many people have been asking if I am running Iditarod, Yukon Quest or other smaller races this year. Good question! This doggy lifestyle was a dream that was delivered from my soul more than 14 years ago. And in 2011, I decided to make my dream come true. Over the past 6 years, a large part of my heart, soul, time, energy and finances have been poured into my goal of "I want to run Iditarod someday". My team has now successfully finished every race we've started, including two Iditarods (2016 & 2017). This makes my heart and soul shine! I'm very proud of my loving and hard-working team. In an honest effort to honor my best self, last fall I committed to not running Iditarod in 2018. Because Tara had done so great with the dogs throughout last season, I offered Tara the opportunity to run Iditarod 2018 with my team (I have a small kennel = one team). We are psyched to have Tara back full-time at Bacon's Acres starting mid-September! I am eager to have more of a mentor and handler role this season, which will allow me to follow Iditarod with a very different, more experienced perspective. I feel it will provide an opportunity for valuable insight into future training and racing. It will also allow me some extra time, energy and freedom to re-balance my life. Already, this summer has been filled with activities which will allow my team and I to thrive as we move forward in life. Thank you for continuing to love and support our team! It wouldn't be nearly as fun without being able to share the excitement with you. Here we are just two weeks past sign-ups, and it still is SUCH a surreal feeling to me!! I remember walking up to the happy yellow tent (my favorite color!) to hand in my paperwork and entry fee. And by remember, I pretty much blacked out on my way there. My stomach was in knots, I was giddy with excitement, and though I walked back to the parking lot twice, it was only after the picnic that I realized I had walked that same route four times. It is truly amazing how things evolve over the course of a year. Last year at this time you would’ve found me reaching out to Kristin, hoping she’d say ‘yes’ to me as her handler. We chatted of experiences I had and didn’t have, work I knew and work I could learn, and things I would do and things I wouldn’t do (at least not yet). Over the course of last July, conversations took place that brought me back to the world of sled dogs. The possibility of me running ONE qualifier was part of the conversation. Fall came and went, and many training runs and puppy cuddles went by. Before we knew it, race season was upon us. We agreed the Willow 300 would be the qualifying race I would run. In case the Willow was cancelled, I filled out paperwork for another race, the Tustumena 200. As the heavens would have it, neither race was cancelled, and my paperwork and entry for both races was set: one qualifying race became two. If I finished both races, I would then be qualified to run Iditarod (with one qualifier from 2015 complete), a far off thought at that point in time. But not too far off. Back-to-back race weekends tested and taught me lots I didn’t know. Knife 101 (where I learn DO NOT to lose the knife in the snow), Cooker 105 (where I learn DO NOT drop the matches in the snow either, or store the lighter in anything that isn’t the pocket next to your body), and countless more do's and don’ts in between. I learned there was SO much more to learn, and that I was just getting started. I also learned Kristin wasn’t going to run Iditarod in 2018. And with those finishes, the possibility of me running it started to become a reality. What do ELSE do we do besides run dogs?? Well, there’s a whole BUNCH of things, especially in the midst of race season! And not just during race season. There is always something to be done around the dog yard, in any season, but prepping for races is definitely busiest. Besides training the dogs for trekking long distances, we have to prep all the things we need for those long treks. These things include dog food, gear, and snacks, and people food, gear and snacks. Easier said than done, we can assure you! Not only knowing WHAT we need, but HOW MUCH; these are pivotal questions that dictate how we plan our races, and pack our drop bags. Drop bags: these are the large- upwards of fifty pound- bags that we send to checkpoints during a race. As we race, we stop at checkpoints to gear up and fuel up, with the contents of drop bags. All those little booties the dogs wear? Someone has to wrap them into bunches of 4 (one per puppy paw!). All those tug and neck lines that attach dogs to the main line? Someone has to make those and put snaps on the end. All those small pieces of fish, meat and fat the dogs eat as snacks? Someone has to cut all those up. The list goes on and on. All these small tasks add up to the big picture, which allows us to do what we love to do- run dogs! Public Radio Interview / Article by Zachariah Hughes "Adventure is the Profit..."
(I'm sorry, I'm not techie enough yet to figure out how to click on the link and activate it. You'll have to copy and paste it into your web browser).